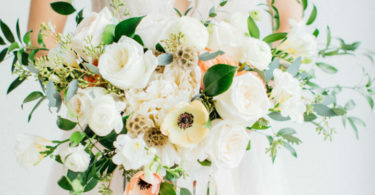 Natural decor and a flowing Grecian gown inspired this soft organic wedding inspiration shoot at the Boone Hall Plantation in Charleston, South Carolina shot by JoPhoto. The beautiful location, including the mansion, the driveway and the weeping willow trees, provided the perfect backdrop for the light and airy set up. Watch a behind-the-scenes clip of this shoot here.